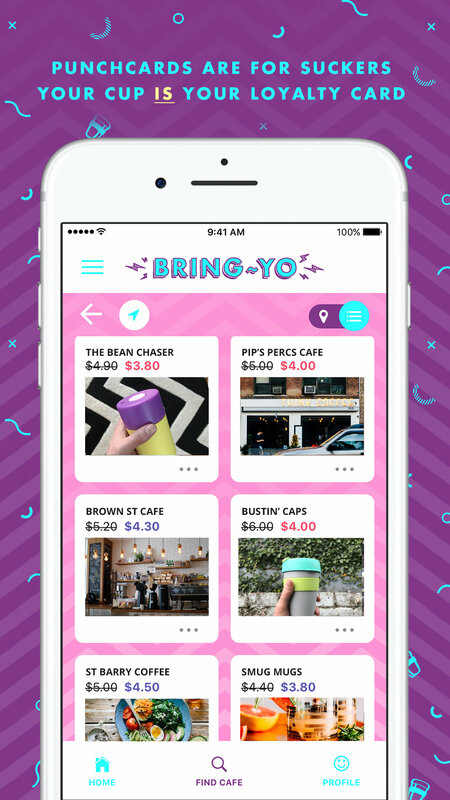 A free map-based app connecting coffee drinkers to awesome cafes with discounts for reusable cups. List your business. Show you care. Use the map-based search to find cafes nearby who reward reusers. Paper cups are not recyclable. We produce 5 billion every year. Most of them end up in the bin, then landfill. That's lame. Reusable cups taste better - some say it's the extra dollop of delightful smugness in every cup. Bringism is a local approach to a global problem; a mindset that is all about reducing the amount of single use plastic and packaging. And it ain't that hard either. Adopting a bringism attitude is easy. Kick the habit by being (a little bit) prepared. How often do you find yourself surprised to be at the supermarket, or the mall? Not very often right? Well, cool - bring yo bag. Do you carry a handbag or a backpack on your commute every day? Then bust a cup in yo bag - too easy. Drive to the shops? Keep some bags in yo boot. Done. Click here to download yo swag. Sign up to the mail list and download the app. Tell yo local - tag your local cafe on Insta or Facebook or even go old-school and use your face. Build a loyal, habitual audience who gets it. Create a free account, upload a pic and a description. Change your offer whenever you like. Get cool free stuff like posters, postcards and promo images for social. Enter your email below and stay in the loop for the best discounts, reviews and special offers. We respect your privacy. We won't jam yo inbox. Yo, nice one. We'll be in touch from time to time.